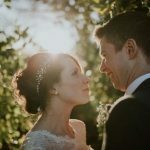 Carmel and Dan married in late April which has got to be one of the prettiest times of the year at the Green with tons of wildflowers and everything a fresh new green. The weather was mild and they had an outdoor ceremony under the Oak Arbour. The flowers were pastel and natural and very beautiful with old roses and peonies in the bouquets, garlands and floral heart and gyp on the ends of the chairs forming the aisle. Instead of traditional canapés Carmel and Dan chose a scone cake which is a fun and relaxed option. The couple were lucky to get some pictures with the bluebells which carpet our woodland and bloom in early spring. 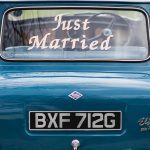 After the wedding breakfast and drinks reception the evening reception started and everyone celebrated with music from The Swing Kings, kegs of local ale and bacon rolls and local home made pasties. A perfect end to a perfect day! Thanks to Carmel and Dan for allowing us to share these and to Liberty Pearl for the photography.